Screen shot from Home Depot website. 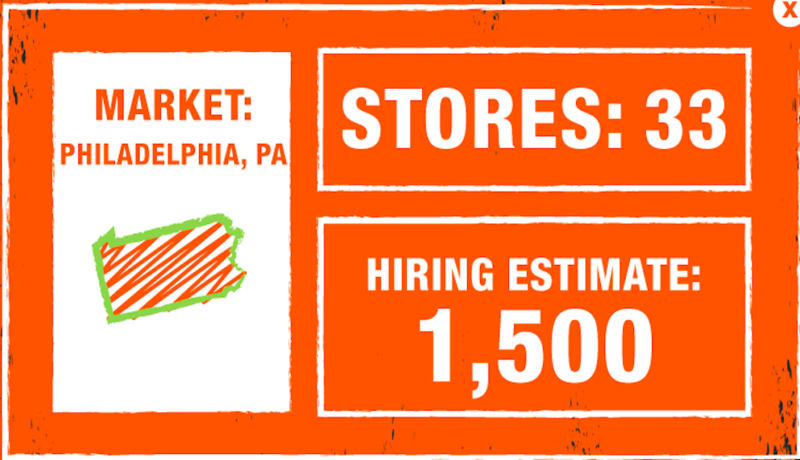 Home Depot is hiring 1,500 workers for its 33 Philly-area stores, the company said today — part of a nationwide hiring spree to grow its workforce by 80,000 people for its spring and summer busy season. In Pennsylvania, another 900 workers are being hired in the Pittsburgh region. The company said that more than half its seasonal hires transitioned to full-time employees last year — and that hourly associates are offered profit sharing, tuition assistance, 401(k)s and a discounted stock purchase plan. Home Depot’s announcement did not indicate, however, the pay scale for its open jobs. Applications must be submitted online at The Home Depot’s careers website.